A Democratic Party spokeswoman said Wednesday that Republican Utah Rep. Jason Chaffetz’s decision not to seek re-election “raises questions” about whether Russia has dirt on him. Kompromat is a Russian term which means compromising material used to force someone to work for Russia. 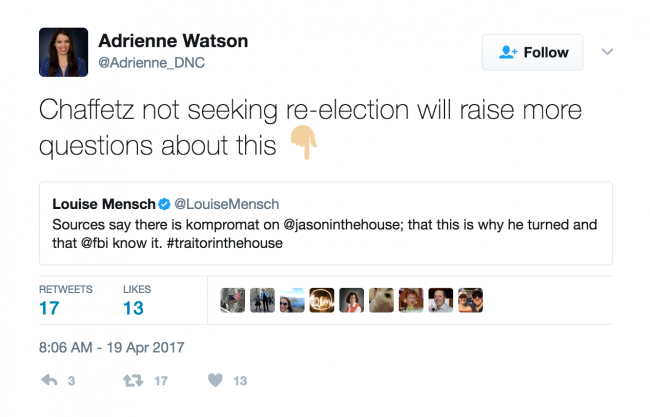 Mensch is well-known on Twitter for spreading conspiracy theories regarding Russia. She has previously said that Russian President Vladimir Putin may have killed conservative journalist Andrew Breitbart, and that Anthony Weiner was actually sexting with Russian hackers, not a 15-year old girl.